I knew I wanted them to stay small so that the crowns almost fit on the base, so it was important to me that they didn’t spread too much. 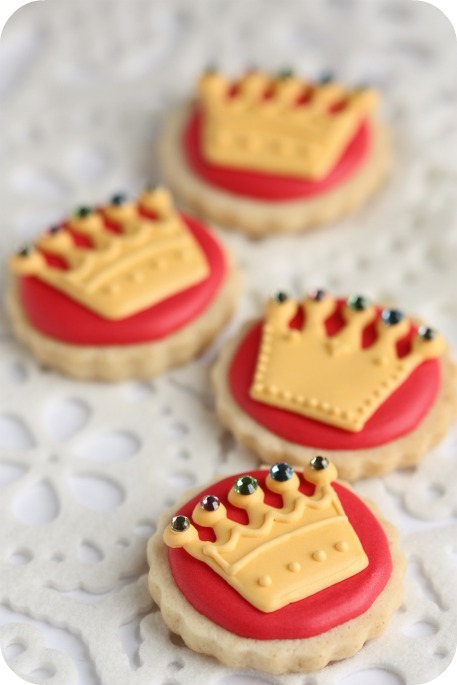 (I had made the royal icing transfer crowns first. Cookies are 4.5 cm / approx. 2 inches across). One thing to mention; the little jewels are inedible; they’re actually Swarovski Elements craft jewels. I just had to add some truly sparkly bling in honor of the royal wedding. 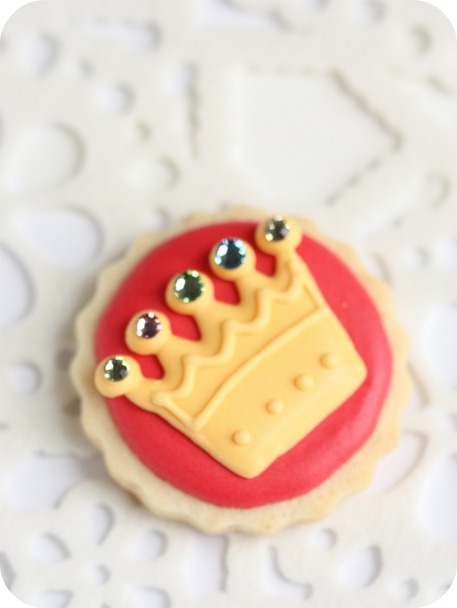 😉 To prevent the whole cookie from being inedible though, I made the crown a royal icing transfer and just barely iced it to the cookie base, so that it could easily be removed. Another point to mention; the cookie design came from here. 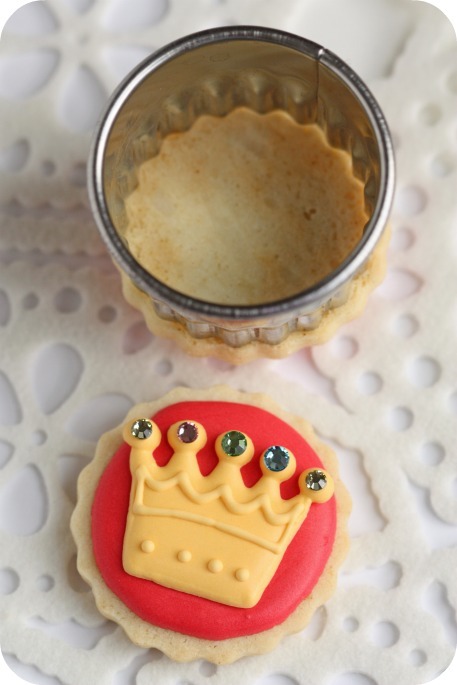 Several of these tips are already in my Sugar Cookie Recipe, and a few are new. By communicating with some of you, I’ve realized a few key things which helped me which I hadn’t thought to mention before. A quick note first, a little bit of spreading is normal (see photo above with cookie cutter and cookie); but there are things you can do to help cookies keep their shape! Whichever recipe you’re using, don’t use baking powder in the dough. I used to take it out only for more detailed cookies, now I omit it all the time. Check to make sure your oven really is at the right temperature by using an oven safe thermometer. If your oven isn’t hot enough, the cookies don’t ‘set’ quick enough, and the cookies have more time to spread. Also remember that opening your oven up to peek on the progress of the cookies, will make the oven lose heat and affect ‘cookie spreadage’. Be careful not to mix the butter and sugar too long (Usually the first step of making the dough; called creaming). Overmixing the butter and sugar will cause too much air to be incorporated. I usually mix mine just until the ingredients come together. Speaking of liquid, the amount of water in the butter you buy will affect the spreading factor. As for how to know which butters have more/less water content, so far I’ve just had to experiment with different brands to see what works best. I haven’t found any indication on packaging mentioning percent of water etc. If anyone has more information on this, I’d love to hear your input! I can’t talk about shortening or other types of fat (sorry! ), as I don’t bake cookies with any other fat than butter. It may be that I simply like my shiny, new baking sheets, but it seems to me that cookies baked on a thick baking sheet seem to spread less than on a thin one. Here’s a link to the ones I prefer (click here) , and, so you can see what I mean, a link to the other ones (click here) . How thick are your cookies? The thicker they are, the longer it takes for the heat in your oven to help the cookies ‘set’, and the more time they have to spread. Mine vary depending on how thick I feel like making them, but in general, they’re about 3/4 cm – 1cm thick. If you would like a thicker cookie, try raising the temperature of your oven a few degrees to bake them. Each oven and recipe are different, so you’ll have to play around with this a bit and see what works best. Cover your baking sheet with parchment paper or a silpat rather than greasing your pan with any type of oil/fat. Cookies seem to spread/slide more when resting on a greasy surface. Once you’ve made the dough and it has rested for at least an hour, cut your cookie shapes out and put them back in the fridge for at least an hour or more before baking. Regarding re-rolling dough scraps – I’ve noticed that the very first batch of dough which has only been rolled once, spreads the least, even if I’ve chilled them for minimum one hour. I’m wondering if it has something to do with the gluten in the flour being overworked. Hope these tips help! If you have any more ideas, comments or questions, please feel free to share them here, in the comment section, or on my facebook page here. Sorry, Danielle, I missed your question earlier! What you mentioned is perfectly fine! I hope you ended up doing that and are soon ready for your party! Hi! Me & my 8 yr old gal simply loves your website. Awesome. We r gonna try out the sugar cookie. Question is….what kind of flour and sugar r we looking at? Plain flour? Castor sugar? HI @ Nora: I’m so glad to hear that! I use all-purpose plain flour, and granulated sugar. Hello. I just wanted to ask if it is possible to use butter tha is not unsalted? Thank you. Yes, you can – just omit the salt from the recipe. I should mention though; I have noticed that salted butter (which is less expensive), seems to spread more. I wonder if there is more water content/less fat content in it. Just an fyi. I made your cookie recipe last Saturday (which was amazing) and I had a lot left over iv had it in the fridge will it be ok for me to use this week ? I love your blog. Thank you so much for all the tips. I found out if I freeze my cookies on parchment on a cookie sheet over night, (I put all cookies on one cooke sheet with parchment in between layers) and I bake them at 375F. I just move each layer with its parchment to a room temp. cookie sheet and bake them while frozen, it helps not to spread, also I add one cup of flour to your ingredients which works great. Cookies end up light color and still taste great. I just wanted to share my tips. Thanks again for every tip you put. I never use baking soda either, just AP flour, butter, sugar, eggs and vanilla. I always roll out my dough to 1/4 inch thickness between 2 sheets of parchment then stick in the freezer for 30 min to an hour, cut out the shapes, place on a silpat lined half sheet pan, stick back in the freezer while the oven preheats (about 15 min) and bake. I have not had any spreading issues since I used this method. I roll my scraps of dough between the parchment paper and repeat the process. using the paper instead of flower keeps the cookies from being tough. This is mine and my daughters exact method. Works great for us. Hi, I am going to be making some sugar cookies that keep their shape and I love your tips to make this happen. I am curious though, you say the oven needs to be at the right temperature so the cookies set, but you also say to refrigerate before cooking them. Wouldn’t putting them in the oven cold, make it take longer for them to set, and then spread? It’s interesting, isn’t it!? I’ve experimented so many times, and yes, they do keep their shape better when the dough is chilled and put into a hot oven. Exactly why I’m not sure, but if you like, try one tray of cookies which has been chilled and another which is at room temperature and then bake, and see what happens. You’re so sweet to give all this helpful info! I’m sooo going to omit the baking powder my next batch! P.s. I don’t have a problem with spreading, tho, I just want to see if there’s a difference. Thanks Misty! Have fun baking! Which sugar do you use? Just plain old sugar, caster sugar which is finer or icing sugar? Hi Vikkie, just plain old, regular, granulated sugar. For the water content of butter, the most common butters sold in the US (and I assume, Canada) usually have anywhere from 50%-70% butter fat. So they have anywhere from 30%-50% water in them. Like you said, the cheaper the butter, usually the more water. If you want a butter with less water, European style butters start with a butter fat content of 80%. A few examples are Kerry Gold Irish Butter and Plugra. These tend to be quite expensive, but you can definitely taste the difference in your baking and cooking. Thank you, Alexa! I was thinking of you the other night, when I was looking at the butters at Walmart. Walmart actually have the Plugra. I was so surprised. Thank you for the info on the butterfat. Very important, and again, thank you! Is there a way to offset the baking powder already in dough? Is there any ingredient I can add to reduce spreading if the dough is already made? I was wondering the same thing. A customer recently brought me a cookie dough that her family absolutely loves to use for her son’s birthday cookies, but on my first trial I realized that it spreads significantly. I would love to use the cookie dough that she brought me but I can’t figure out how to adjust it. Have you found any answers to this problem? Im sorry if I missed it somewhere…but how many cookies does this recipe yield? Thanks so much! I had a great shortbread cookie recipe on the back of the corn starch package. Once they removed the recipe and added a new recipe online, I noticed the cookies spread. I’m an impatient person and want my cookies done right after I mix them. So when the new recipe asked for chilling and they still spread, I was pretty mad. Anyways, I’m using my different cookie sheet with parchment paper and trying not to overmix. It’s working like a charm! Cookies that spread drove me crazy! Some spread, some didn’t, no particular reason. In a fit one day I took the tin cutter I was using and recut the hot, spread cookie right on the sheet out of the oven. Then, I stuck the cookies back in the oven for about 30 seconds to “seal” the edges (not sure why I did this). While it’s not a perfect fix, it can help with frustration of spreading cookies. You have to work fast though while the cookies are still piping hot and the tin cutter gets hot too so be careful! Fast forward..I also ended up adding 1/4 cup more flour to my shortbread dough and it seemed to help the grocery store butter I use. Yay! Thank you so much for this Liz. I too was driving myself crazy with the spreading of my cookies. Now they are perfect. Hopefully the icing part goes well. Marian, are your cookies really 3/4″ thick, or do you mean 1/4″? thank you so much for the tips! Learned most of these at Culinary school, but a reference page is always a plus! 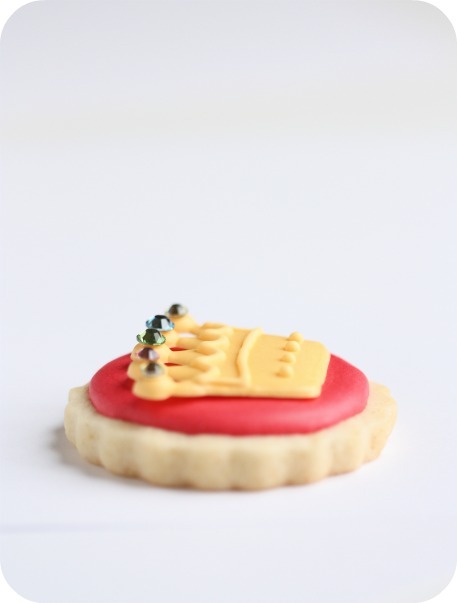 Btw- looove your cookie ideas, esp matching them to a ribbon! thanks for sharing! Will omitting the baking powder change the overall texture of the cookie? I like my sugar cookies to be thick, soft and chewy. I hate dry and crunchy cookies! Before I take it out of my next batch I just want townie what you think. Thanks!! No, I don’t find that taking the baking powder out makes much difference in terms of the overall texture. They will be a bit more dense, but, if you like yours softer, bake them until the middle no longer looks wet (turn on the oven light and peek through the glass… you’ll be able to see if the middle still looks glossy/wet). When the surface no longer looks wet, take them out of the oven. The trick is to not bake them too long if you like them soft. You also won’t have the golden brown edges if you don’t like them crisp. About shortening: they will spread less and be softer if you substitute shortening for butter. Vegetable shortening (and lard) have higher melt points than butter and less water in them. Doing a 2/3 shortening/butter mix is a good compromise. Interesting! I’ve yet to try that, thanks Lucky2cope! I like to use my Grandmother’s sugar cookie recipe which uses buttermilk and tends to make a thicker, soft, cake-like cookie. Would leaving out the baking powder be ok on this type of sugar cookie? Yes that should be fine too. Marian, Thank you for so much good info. Really helps us new cookie bakers. Can butter be too soft? And my cookies with corn syrup icing look splotchy when dry. Why? I did freeze my baked cookies for 3 days before decorating. I figured it had to do with fat content in the cookie. Would appreciate help. Want to start on Christmas cut outs soon…Thanks. I’m sorry for the delay, Christmas preparations have been keeping me busy. Butter can be a bit too soft yes, but, as long as it’s not at the liquid melted stage, when you’ve finished the dough, as long as you chill it really well, that should help with the spreading issue. Great tips. Martha Stewart says to chill and that has worked. I used her recipe this Christmas with the first batch coming out perfect. I made a half batch as I needed more and the cookies spread like crazy. I was then following celebrity chef Curtis Stone, after watching a video, who said creaming the butter and sugar should have no grainy feel so I creamed longer. He said to do that until you feel no grit. Perhaps that was it. I am going to try no baking powder next. I had wondered about that as I once had a recipe that didn’t call for it. I recall it worked out well all the time. Your cookies are beautiful. Have you ever tried using clarified butter? Like, if you melted unsalted butter down and patiently skimmed off everything that is not actual butter? I would assume it would yield a much higher fat content, maybe an actual 100%? Would that help the taste (I haven’t made the cookie recipe yet) and still keep the cookies from spreading? Or is that too high of a content? I think the easiest way to tell the water content of butter is to look at the calories. Fat has 900 calories per 100g whereas the butter I buy only has 744 calories – this 17% reduction is made up of water. It’s the same if you look at the fat content of butter – mine has 83g of fat per 100g of butter which leaves 17g water. Thank you for sharing These, iam Working on my new product for my Homebase Bakeshop and iam Planning to make chocolate cookies with nutella and the consistency of the cookies i want is the one that not spread much and at still soft and chewy.. Thank you I learned a lot! How do I make gingerbread cookies without them spreading? Same tips? I find sugar cookies too sweet and gingerbread yummy!! Also would love any tips on how I can keep my cookie’s crisp after icing? I would like to give them as presents but they seem soft after leaving them out over night to dry! OMG – #6 The baking sheet tip did the trick. I tried the European butter, freezing, rotating the sheets midway, etc., but never thought to switch to the professional baking sheets (which I had). Same batch of dough (I do freeze them for 15 minutes on parchment after cutting and before baking). Moved them from the thin sheets in the freezer to room temp professional sheets and finally, minimal spreading. Dang – I was going to insist on a new oven – which is still on my wish list – but for now. Thank you for sharing this simple tip. Hi Sylvia, great to hear, thanks for sharing! I have the opposite problem! by shortbread cookies shrink! what can I do to solve this problem? Besides perhaps trying a new recipe, maybe trying the opposite of the suggestions made in this post. Please let me know how it goes. Just read an article at King Arthur Flour that suggests lowering oven temp by as much as 50 degrees to prevent spreading.